This site is my own personal homage to everyones favorite Bad Guy and Star Wars. 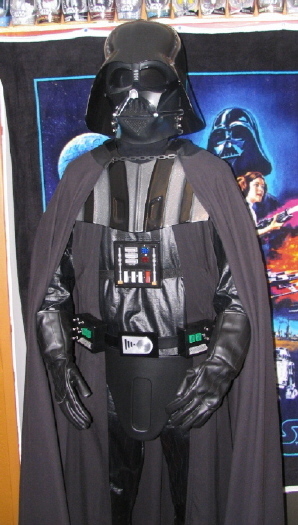 Build your very own FULL SIZE Darth Vader Prop / Costume and REAL METAL Lightsaber!!!! , download and build my FREE!! Paper models of Star Wars Characters & Ships, Kill ar Jar Binks or just look around. This site is 100% FREE! and non profit. New features are added regularly and future additions for a Build a Lifesize R2-D2 and various other projects are in the works, all FREE!! for you. Download, print and build my FREE!!!!! Star Wars paper models of your favorite characters (Go to fun and games at top) to proudly display on your desk at work or the dash of your car. Each model is full color and some even have removable helmets for choice of display. I will try to bring out a new one every couple of weeks but sometimes they run a little late due to other responsibilities. They are totally FREE!! Not in the building mood? Well there is plenty to do here. I will be adding many features as and when I can get the time. I will be adding anything I find interesting or funny or just want to share so feel free to poke around. You can also play Space Invaders FREE here too. 2013 We're back. After a very long break I'm back to working on the site. I am always looking for new ideas and ways of improving the site. If you have any Star Wars characters you would like to see in Paper Model form, please e-mail me and let me know. I will try my best to get the most requested available asap. *This site is not owned or affiliated by Lucasfilm or George Lucas. 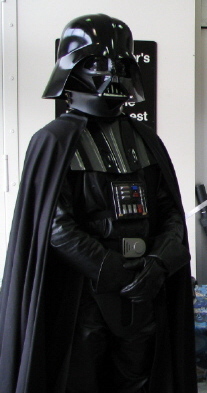 "Star Wars", "Darth Vader" and all associated characters, logos and other elements are the property of Lucasfilm Ltd. Please do not Sue me Mr Lucas. All images and text on this site may not be copied or used without permission. Unauthorised links to pictures will result in removal. Bandwidth theft is uncool. Thank you. All the paper models are designed and drawn by B Huggins and may NOT be offered elsewhere either for free or for ANY fee or donation. They are for personal use only. The Paper Models are artistic representations and ANY unauthorised copying and/or distibution will result in legal action. The subjects of the paper models remain the property of Lucasfilm and all subsideries and affiliates. Use the banner below if you would like to link to my site. Save as .gif and use clickable html img.src. PLEASE DO NOT LINK TO THIS IMAGE DIRECTLY AS IT LEECHES BANDWIDTH. Thank you.